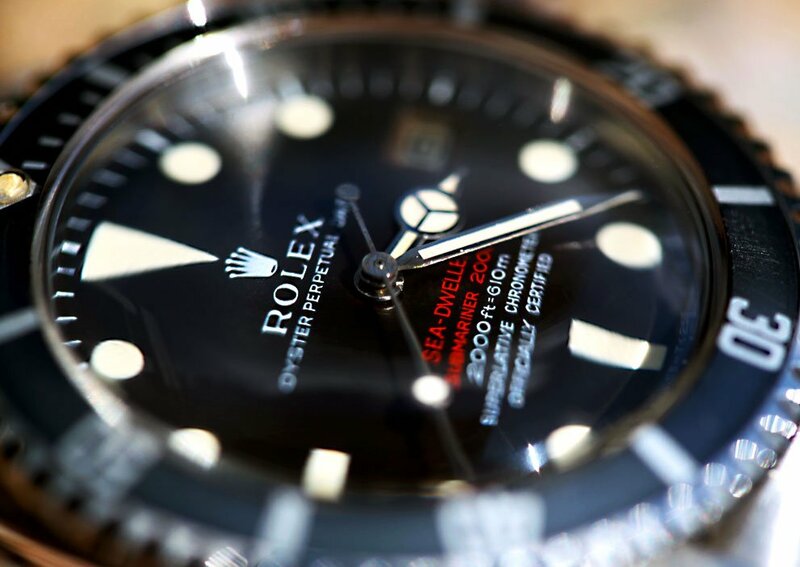 Welcome to the second installment of our in-depth look at the history of the Rolex Sea-Dweller. If you haven’t yet, we strongly encourage you to read the first chapter of the series where we cover the Double Red Sea-Dweller ref. 1665 before you begin this article. If you’re already caught up with that one, then let’s get on with our look at the follow-up Sea-Dweller — the ref. 1665 “Great White”. 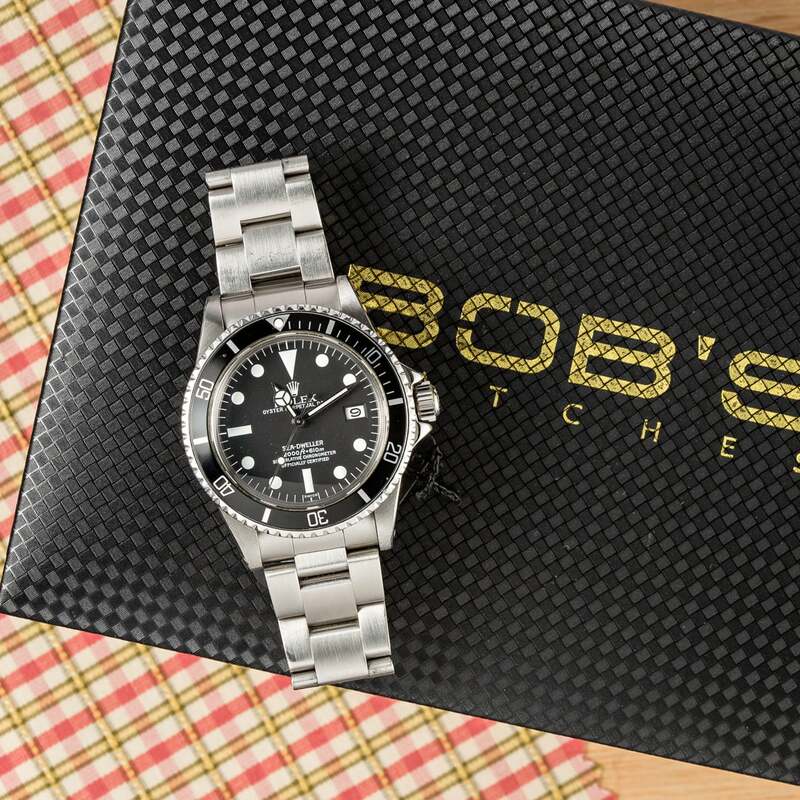 The Stainless Steel SeaDweller 1665 came after the Double Red Sea-Dweller. Following the ten-year production of the Double Red Sea-Dweller ref. 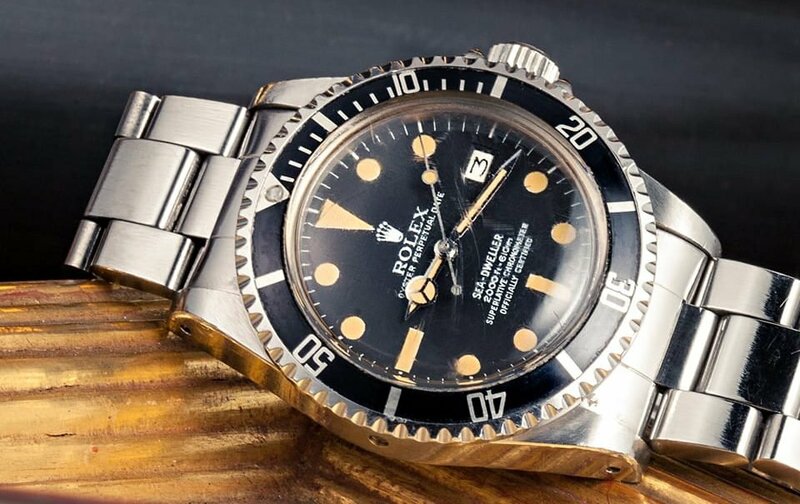 1665 from 1967, Rolex introduced a new Sea-Dweller ref. 1665 in 1977. Although the new Sea-Dweller kept the same reference number, it included several modifications over its predecessor. The most notable difference was the replacing of the characteristic red text on the dial with white writing. Not only is the “SEA-DWELLER” label no longer in crimson, there’s no “SUBMARINER 2000” designation either. Firstly, the all-white font is the reason that this particular Sea-Dweller ref. 1665 picked up the “Great White” nickname. And secondly, the dropping of the “Submariner” label is a clear indication from Rolex that the Sea-Dweller is a model that will branch out on its own rather than just existing as a modified (and glorified) Submariner. Not only is the “SEA-DWELLER” label no longer in crimson, there’s no “SUBMARINER 2000” designation either. In fact, the Sea-Dweller ref. 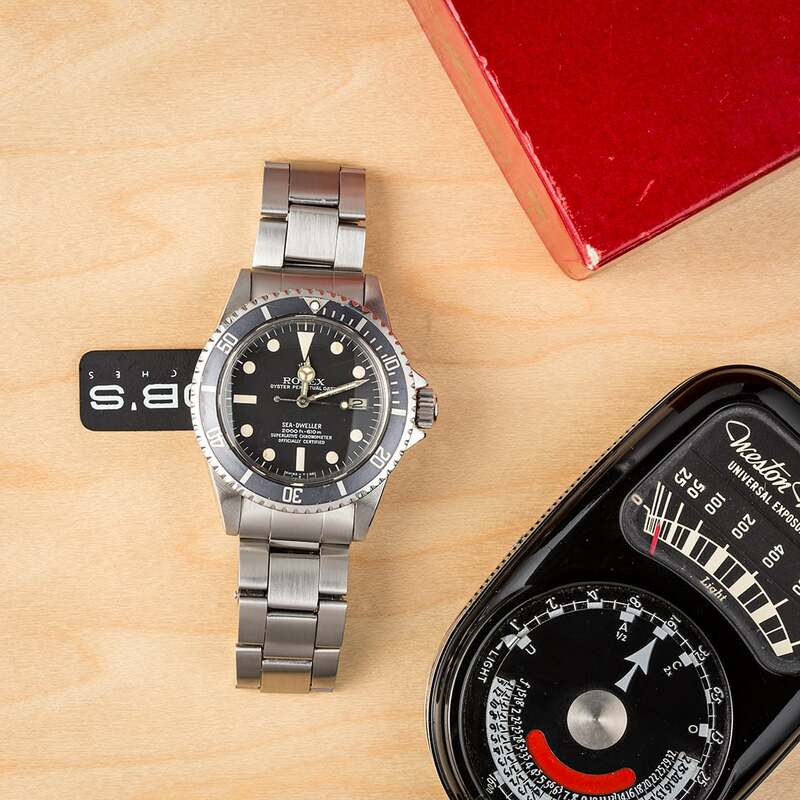 1665 “Great White” did set the tone for future models since the all-white text continued (up until the most recent Baselworld), as did the omission of the Submariner tag. Also worth mentioning is the modification of the “ROLEX” engraving on the caseback on the newer ref. 1665. While the Double Red Sea-Dweller had the Rolex name engraved straight across, the Great White had it curve along with the periphery of the caseback fluting. In regards to similarities to the Double Red Sea Dweller, the Great White kept the same Caliber 1575, the super domed crystal, the lack of Cyclops lens, and of course, the Helium Escape Valve (HEV). Although the Sea-Dweller ref. 1665 “Great White” was in production for less than five years, there are many dial variations to speak of. Five to be exact — Mark 0 to Mark IV. Rolex introduced a new Sea-Dweller ref. 1665 in 1977. MK 0: The rarest of the bunch, the MK 0 dial is characterized by the first line of text, the “SEA-DWELLER” stretching out much longer than the second line of text, “2000 ft = 600m.” Furthermore, the MK 0 dial features a closed 6 rather than an open one. MK 1: On the MK 1 dial, the edges of the first two lines of text line up. Plus, it includes an open 6 instead of a closed one. MK 2: Also known as the Rail Dial, the MK 2 dial has the letter “C” in “Chronometer” in the first row line up exactly with the letter “C” in “Certified” in the second row. Also, the “ft” and “m” in the depth ratings are in italics, unlike in the preceding versions. MK 3: The letter “Cs” in the MK 3 dial do not line up like they do in the MK 2 Rail Dial discussed above. Also, the overall font is slightly different on the MK 3 to the previous versions. MK 4: The MK 4 dial is very similar to the MK 3 dial and only the most devoted vintage Rolex enthusiasts will detect a difference. One distinction is that the number 6 is different between the MK 3 and MK 4 dials. Additionally, the last letter “R” in “Chronometer” is shorter on this dial. It’s interesting to note that Rolex continued manufacturing the Sea-Dweller ref. 1665 “Great White” until the early 1980s even when the new Sea-Dweller ref. 16660 was introduced in 1978. The two Sea-Dweller models were available alongside each other for a few years. The all-white font is the reason that this particular Sea-Dweller ref. 1665 picked up the “Great White” nickname. If you want to know why that was, then stick around for our upcoming chapter on the Sea-Dweller ref. 16660 “Triple Six” coming out very soon.